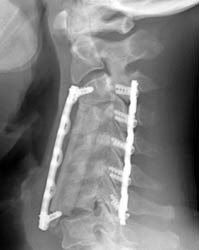 63 yr old with progressive myelopathy and severe cervical spondylosis. Patient underwent 3 level corpectomy (C4-6) and anterior cervical fusion to decompress the spinal cord ventrally and return some cervical lordosis. 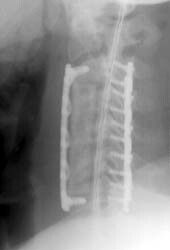 Lateral radiograph taken immediately after the initial operation. The C4, C5, C6 corpectomies with central strut graft placement is seen, and an anterior fixation plate with screws at the C3 and T1 levels are identified. No immediate hardware complications noted. Lateral radiograph 4 months post-op demonstrating the strut graft now displaced anteriorly, and the inferior fixation screw is not located in the vertebral body. No acute fracture seen. Click on the images to view a larger version!